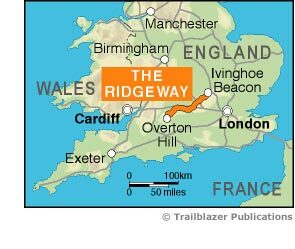 An 87-mile (139km) National Trail, the Ridgeway runs from Overton Hill near Avebury in Wiltshire to Ivinghoe Beacon in Buckinghamshire. Part of this route follows Britain’s oldest road, dating back millennia. Taking 5-7 days, this is not a difficult walk and the rewards are many: rolling countryside, Iron Age forts, Neolithic burial mounds, white horses carved into the chalk downs and picturesque villages. With accommodation, pubs and restaurants in detailed guides and maps to 24 towns and villages including Marlborough and Avebury. Includes 53 detailed walking maps – the largest-scale maps available – at just under 1:20,000 (8cm or 31/8 inches to one mile) these are bigger than even the most detailed walking maps currently available in the shops. Itineraries for all walkers – whether hiking the entire route or sampling highlights on day walks or short breaks. Detailed public transport information for all access points. Practical information for all budgets – what to see; where to eat (cafés, pubs and restaurants); where to stay (B&Bs, hotels, hostels, bunkhouses and campsites).